I don’t know why this never made it to the blog… at least I don’t think it did. Probably because when I made it up (last summer I think), it went right into use. 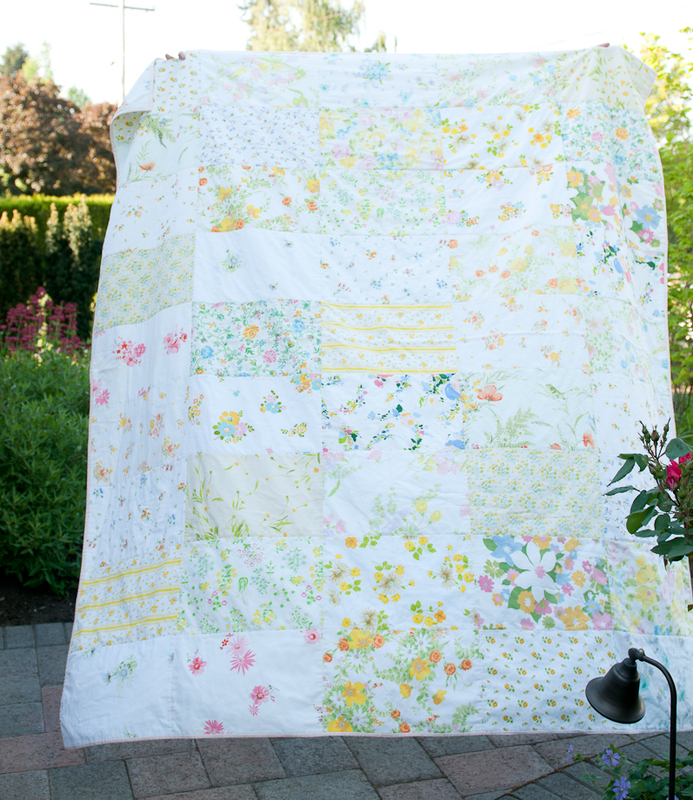 Here is a little bit of the fabric I used, and I also participated in a vintage sheet swap that helped make up this quilt. Really, if you’ve never quilted you could still make this quilt. It’s so dead easy. Big blocks, stitch in the ditch, and a nice solid binding. I did take the time to do a hand stitched binding, which gives even a simple quilt a nice finished look. It’s actually more of a blanket because the batting is flannel instead of actual batting. It makes it so soft and light. Plus easy to fold up and take along. I might do another “quilt” like this with favorite fabrics that I want to see a lot of the pattern. I know I have readers that haven’t quilted at all, but want to. Might I suggest something like this? Give it a try!